This pie, which is made uber rich thanks to brown butter, roasted and salted pecans and espresso-soaked dates, is going to be the star of your Thanksgiving dessert table! Brown butter pecan pie with espresso dates is more complex and sophisticated than a standard pecan pie, sort of like an older sister who’s been living abroad. You will want this pie as your special Thanksgiving guest. Move over pecan pie. 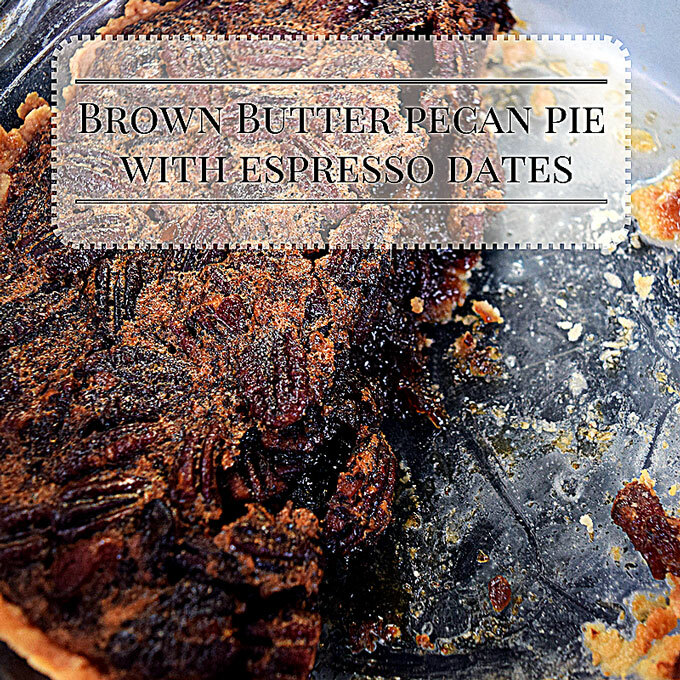 Your sophisticated older sister, also known as brown butter pecan pie with espresso dates, has moved to town. This pie will be the star guest at your Thanksgiving table. Total disclosure, dates are not in my top ten fruits so I wouldn’t normally have made this pie of my own free will. But, two of my favorite food bloggers, Zach and Clay, formerly of The Bitten Word, assigned this pie recipe to me as part of what turned out to be their last Fakesgiving, which tests many Thanksgiving recipes that the food rags (magazines) have put out for this holiday. I was skeptical about this recipe because I don’t trust dates. They look like oversized raisins and I don’t trust a raisin. Plus, my only real experience with the fruit is at an annual gathering my yoga teacher hosts after the annual winter solstice class. Someone inevitably stuffs dates with goat cheese and drizzles honey over the whole plate. Okay but meh. There are also date appetizers at the occasional wine tasting my natural foods store hosts. They stuff dates with goat cheese but also wrap a crispy piece of bacon around each date. 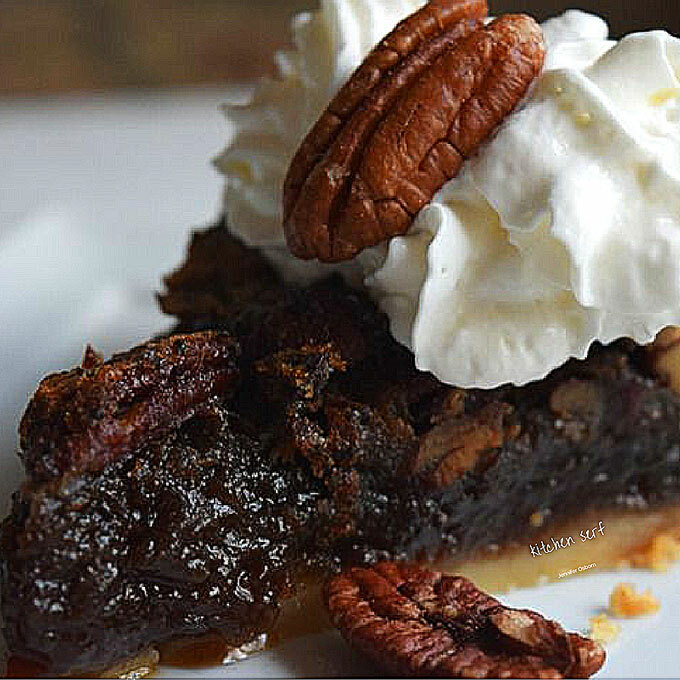 I’ve learned that dates really sing when soaked in espresso and scattered across a pie crust to be covered with toasted pecans and pecan pie filling–you know brown sugar, corn syrup and eggs. Brown Butter Pecan Pie with Espresso Dates is even better after the pie sits a day or two. The dates soften into the brown sugar and the filling gets all caramel-y. Chef Maura Kilpatrick of Oleana created this recipe, which was first published in Food & Wine. I have adapted it slightly to suit my taste. Instead of light corn syrup, I use dark. I also prefer dark brown sugar to light. Use what you like. I think that I may try this pie two more ways: first, by soaking the dates in espresso for a couple of hours instead of just sauteing them in espresso. Second, I think soaking the dates in bourbon would be a tasty alternative too. When you serve this pie, you’ll want to have lots of whipped cream on hand. In a food processor, pulse the flour with the sugar and salt. Add the butter and pulse until it is the size of small peas. Add 1/4 cup of ice water and pulse until the dough is evenly moistened. Gradually add more water if needed. Turn out the dough onto a work surface and knead 2 to 3 times, just until it comes together. Form into a disk, wrap in plastic and refrigerate until firm, about 1 hour. On a lightly floured work surface, roll out the dough to a 12-inch round; transfer to a 9-inch pie plate. Fold the edge of the dough under itself and crimp the edge. Freeze the piecrust for at least 2 hours or overnight. Preheat the oven to 350°. Line the piecrust with parchment paper and fill with pie weights or dried beans. Bake for about 15 minutes, or until lightly browned around the edge. Let cool. Spread pecans on a rimmed baking sheet and toast until fragrant, about eight minutes. Set a timer and pay attention. Pecans can burn quickly. Let cool. In a small skillet, cook the dates in the brewed espresso over moderate heat, stirring, until very soft, 3 to 5 minutes. Scrape the mixture into a small bowl. Add the butter to the pan and cook over moderate heat, swirling, until the milk solids turn a deep golden brown, about 5 minutes. Let cool slightly. In a large bowl, whisk the brown sugar with the corn syrup, espresso powder and salt. Whisk in the eggs, then gradually whisk in the brown butter until the filling is smooth. Set the pie plate on a rimmed baking sheet. Spread the espresso dates in the crust and scatter pecans on top. Pour the filling over the pecans. Bake at 350 for about 75 minutes, or until the filling is set around the edge and slightly jiggly in the center. Transfer the pie to a rack and let cool completely. Serve with whipped cream.